Created by Robert D Fearon and brought to Xbox 360 by Andy Noble, Squid Yes! Not So Octopus! is an arena shooter, a one-screen enemy blitzkrieg that draws on almost 30 years of frantic laser blasting. 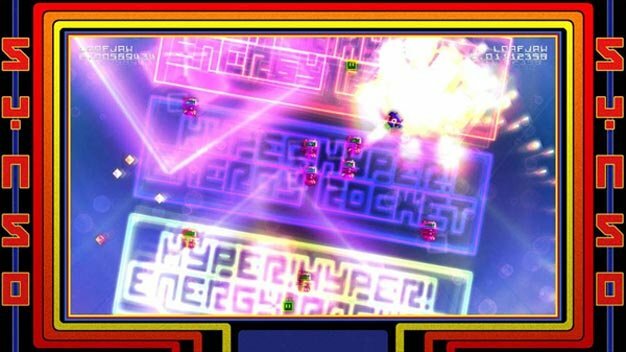 Named after a lyric from 80’s rockers Half Man Half Biscuit, its lineage can be traced from 1982’s Robotron, through the neon pschedelixplosions of Jeff Minter, all the way to the form’s most recent incarnation, Geometry Wars. It’s an interesting little game; at once a reverential homage, a knowing parody and a creation all of its own. SYNSO started life as a forum joke. In a thread about ridiculously high, “Gigawing-esque enormo scores” in shooters, a commenter made a throwaway, sarcastic gag wishing for a game with a maximum score of 9. So that’s exactly what Brit indie dev Fearon set out to do. He began creating a game in which the goal is to survive for 8 minutes and the highest possible score is 9. Almost a year, several late nights and a cult PC game later and that joke is now a fully-fledged release on Xbox 360’s Indie Games service. How’s that for an origin story? Here’s the set-up. The eponymous SYNSO is an atomic radioactive squid with anger issues. Today is his birthday. Unfortunately, it’s also the day that alien robots from the planet Thwip have chosen to invade his home. Suitably enraged, SYNSO the squid must go out and “show the Thwippers that they really picked the wrong house, the wrong morning and the wrong goddamn squid this time…” It’s charmingly satirical, hilariously mocking context in a genre that needs none. Shoot, avoid, repeat. Nothing else is important to a shoot ’em up and Fearon knows it. But SYNSO isn’t just an eyebrow-raised, sniffy anti-game. It’s a fun title in its own right. Unlike most of its precursors it has a single stick set-up. As such you can only fire in the direction in which you are moving. This has a massive effect on the way the game is played. Whereas twin-stick shooters encourage a careful evade while reverse firing approach, SYNSO demands that you charge at your enemies head on. It’s unnerving at first, almost counter-intuitive, but there’s a delirious kamikaze thrill to diving, lasers blazing, at half a screen full of enemies only to emerge victorious and unscathed from the resulting massive neon eruption. What SYNSO does best, however, is nail the difficulty levels. This is an undoubtedly tough game. We came nowhere near the 8 minute finish line. Nowhere near. But it never dissuaded us from having one more go. The reason for this is that despite being rock hard, the game is actually quite forgiving. Hitboxes are large and collision detection is pleasingly soft. So when you die, it is your fault. Like any good arena shooter, especially one such as SYNSO that only has one gameplay mode and only gives you one life, this is probably the most important factor to balance. When you die you aren’t enraged by the game conspiring to kill you, you are encouraged to try again. Death isn’t the game’s fault, it’s yours. Alongside his work as a bedroom coder, Fearon is a keen advocate of accessibility. As such there are a number of optional gamer assists that can be activated in SYNSO. There’s a one-switch mode, allowing the game to be played with the use of just a single button, a practice mode in which you can turn of enemy collisions and a raft of visual and audio settings. For such a humble release it’s a massive amount of options, something larger devs could learn from. So there you go. A joke on a forum, an angry Squid, a bizarre lyric, a postmodern pastiche, a champion for accessibility and a fun little game. Squid Yes! Not So Octopus! is every single one of these things and it only costs 80 Microsoft Points. That’s precisely half the price of a naff Gears of War helmet for your avatar. We know which we would rather have.